A stunning display of hand-made flowers will be filling the Theatre Royal Plymouth mezzanine floor from Tuesday 3 until Saturday 7 April, as part of a project called Dove Tales – Flowers, which is bringing together women from across the city. The Dove Tales – Flowers project began with women from Dove Tales, a group for isolated female refugees and asylum seekers in the city, run as part of the Theatre Royal Plymouth’s Creative Learning Programme and funded by Comic Relief. Dove Tales participants made flowers out of recycled paper that means something to them, for example the manuscript to a favourite piece of music, an article featuring something or someone they know or brochure pages featuring a show they have a connection with. This creative activity provided an opportunity for the women in Dove Tales to share their experiences and get to know each other better. The women also met other local groups such as the Women’s Institute to pass on what they’ve learnt and help others create flowers, while learning more about the city and the people in it. The exhibition of flowers will represent and celebrate the diversity of all members of the community who contribute their skills, talents, interests and cultural backgrounds to the city. Each flower will have a petal with a unique message from its maker. 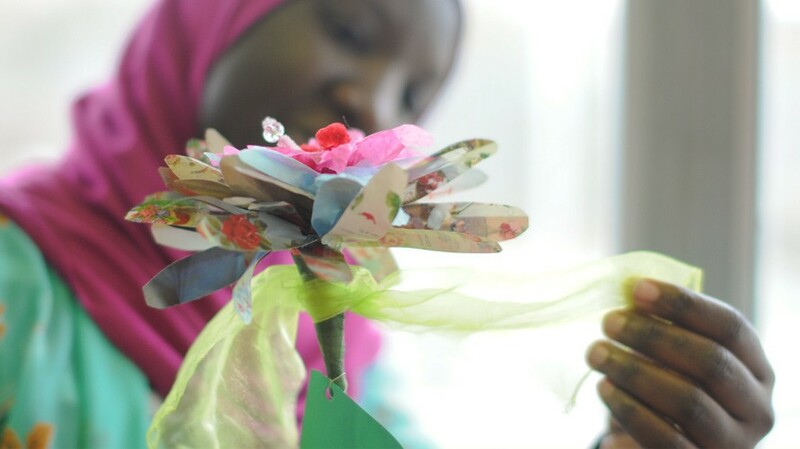 All the flowers made throughout the project will be displayed at the Theatre Royal, and anyone else who feels inspired to create a flower to add to the project is welcome to ‘plant’ their own. To find out more about the Theatre Royal Plymouth’s Creative Learning Programme, call the Creative Learning office on 01752 230379 or click here.